Due to recent trends in the precious metals market, it looks as if the U.S. Mint on Wednesday will increase the price of its 2012-W Proof American Platinum Eagle Coin. Prices for numismatic gold products, however, appear steady with no expected changes. Platinum has been somewhat volatile, though trending solidly higher since last week. So unless Wednesday’s London PM Fix for the metal comes in below $1,650 an ounce, the U.S. Mint will raise the price of the 2012-W Proof American Platinum Eagle Coin by $100 from $1,892.00 to $1,992.00. Update: The U.S. Mint did, as expected, increase the price of the American Platinum Eagle to $1,992.00. To decide whether prices should change for its numismatic coins containing precious metals, the United States Mint sticks to a pricing policy that calls for an evaluation of weekly gold and platinum averages. Calculations use prices from Thursday’s AM Fix to Wednesday’s AM Fix. The evaluations then call on Wednesday PM fixings as final indicators of the weekly trend. Currently, the price-setting range for the 2012-W Proof American Platinum Eagle Coin is based on a London Fix weekly average of between $1,550.00 and $1,649.99 an ounce. As of Tuesday afternoon, however, the several day average is $1,681.87 an ounce, making the Wednesday AM fixing nearly inconsequential. That is why the Platinum Eagle’s price is almost certain to rise Wednesday unless the triggering PM fixing is below $1,650 an ounce. When the United States Mint adjusts numismatic product prices, it usually suspends online ordering of the affected products until changed and tested. That tends to happen just before the noon hour on Wednesday, around 11:00 a.m. to 12:00 p.m. ET. The entire process usually takes less than 30 minutes. 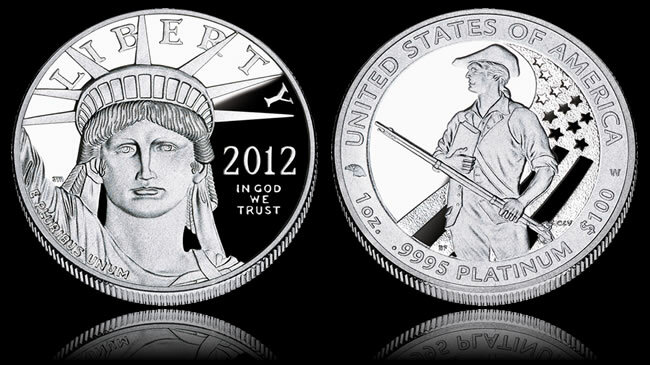 The 2012-W Proof American Platinum Eagle Coin was released on August 9, 2012 at a debut price of $1,692.00. Several pricing adjustments have since been made. The last one occurred on October 24 when its price moved down $100. The latest available figures from the U.S. Mint as of January 14 have the Platinum Eagle’s sales total at 7,602.